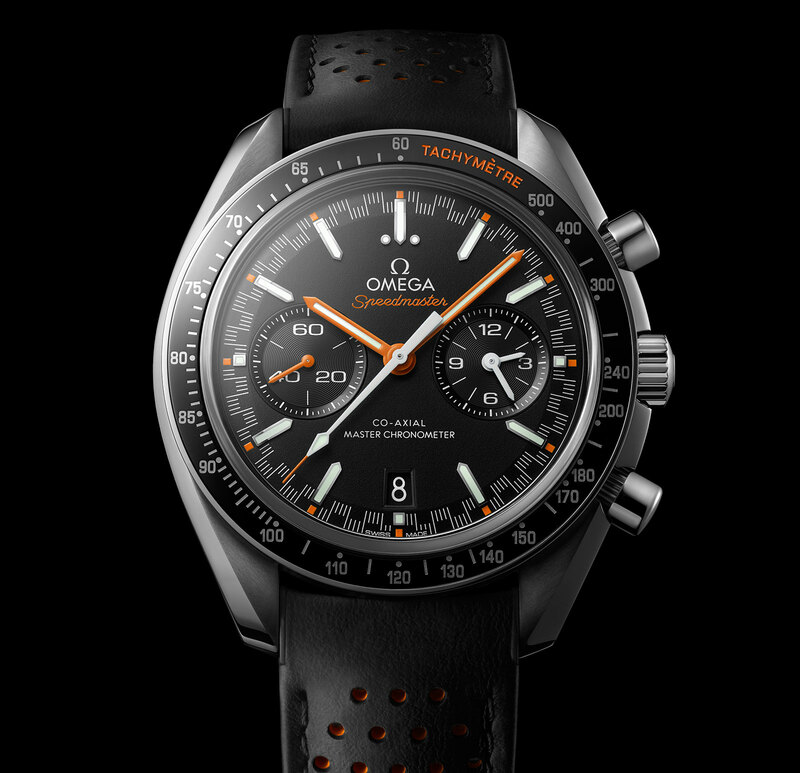 The black and orange dial is characterised by square orange accents for the hours and alternating minute hash marks, a look typical of the 1970s nicknamed “Racing”. 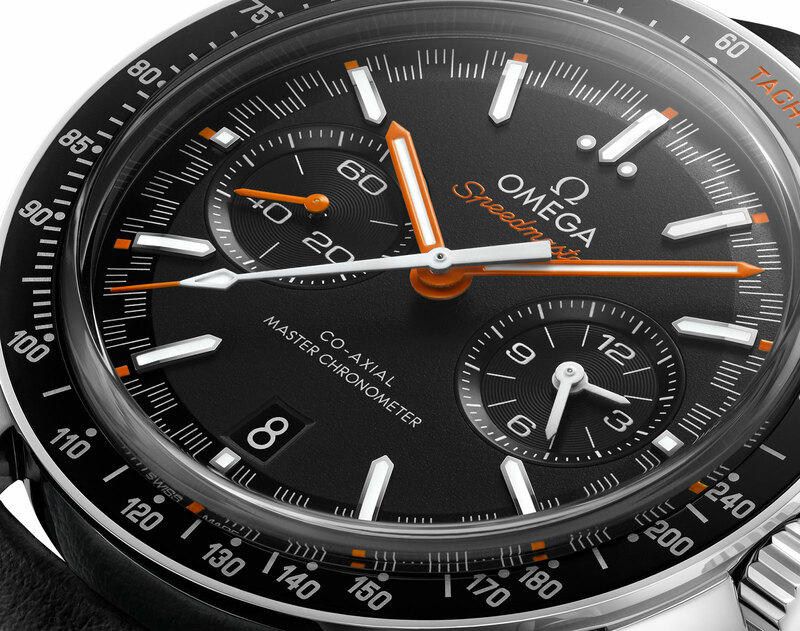 The very same style was also revived for the Omega Speedmaster Mark II of 2014. 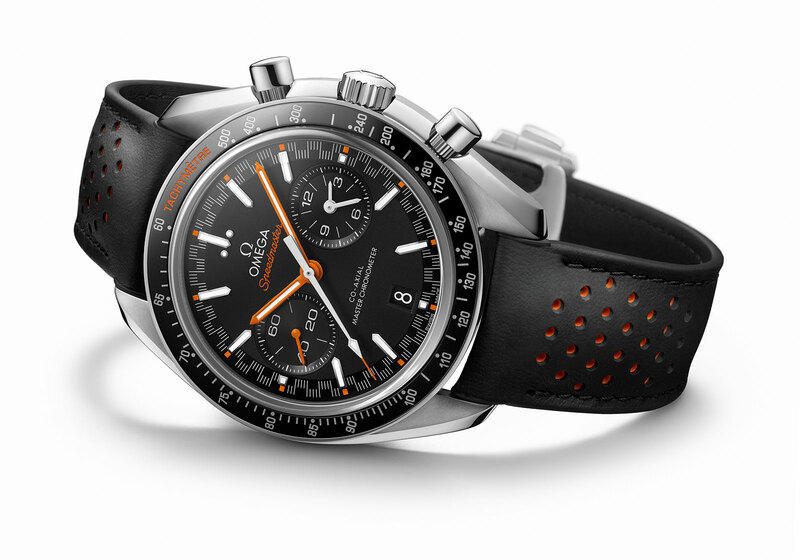 Despite the retro vibes the Speedmaster Automatic is tangibly modern. The arrowhead hour markers are 18k white gold, while the 44.25mm steel case features a black ceramic bezel. And the calibre 9900 inside has all of Omega’s latest technology, including exceptional level of magnetism resistance, a silicon hairspring, and METAS certification. 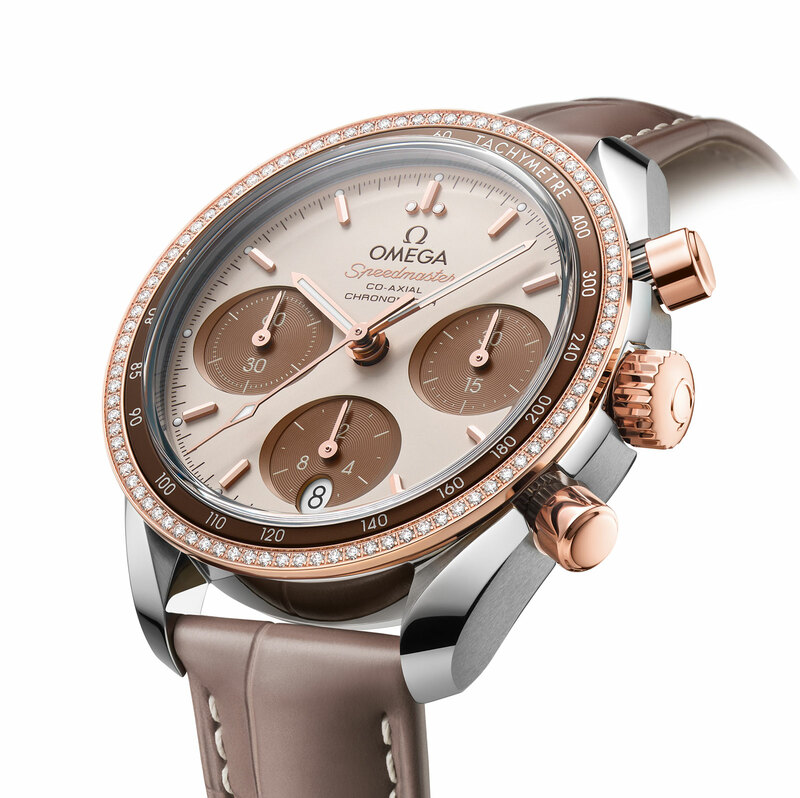 One of the few Speedys designed for ladies, the Speedmaster 38 Cappucino is two-tone: the 38mm case is stainless steel while the bezel, crown and pushers are 18k Sedna gold, the fade-resistant gold alloy proprietary to Omega. The outer rim of the bezel is set with diamonds, while the inner track is inlaid with a brown aluminium tachymetre insert. The colour scheme continues on the cream dial that has ovoid brown sub-dials, while the hands and hour markers are also 18k Sedna gold. Inside is the calibre 3330, Omega’s basic in-house chronograph movement that features the friction-free Co-Axial escapement and a magnetism-resistant silicon hairspring. The Cappuccino is the first of a new line of ladies’ Speedmasters, but the 38mm case is not new. Having been introduced sometime in the 1990s the Speedmaster “Reduced”, as it was then known, existed in various guises as both a men’s and ladies’ watch. 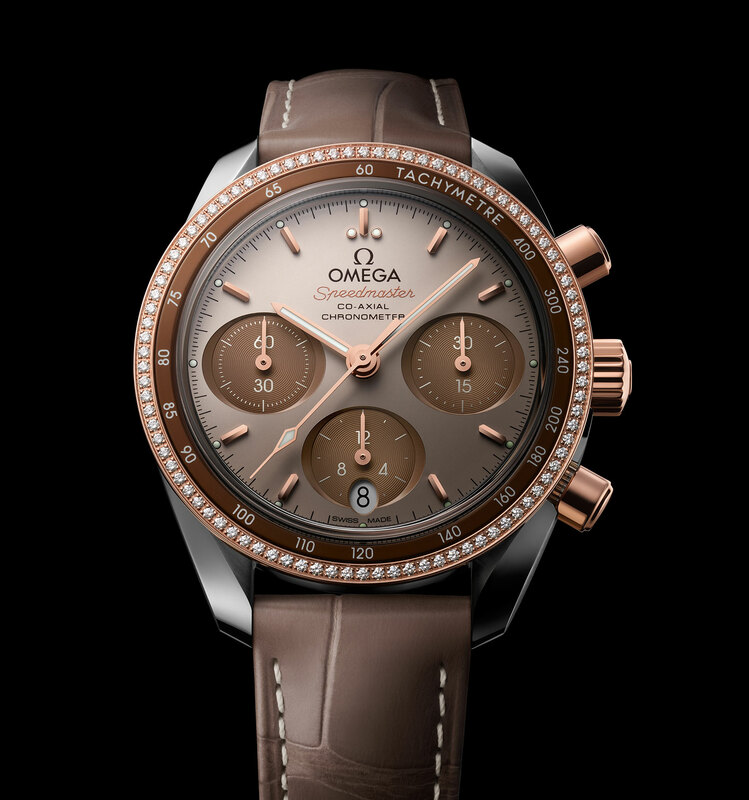 The Speedmaster 38 Cappuccino (ref. 324.28.38.50.02.002) is priced at SFr8600 or S$12,900.